When this card is Normal Summoned: You can excavate the top 3 cards of your Deck, and if you do, you can add 1 excavated “Salamangreat” card to your hand, also shuffle the rest into the Deck. If this card is in your GY, and a face-up Spell/Trap is on the field: You can discard 1 “Salamangreat” card; Special Summon this card, then you can destroy 1 face-up Spell/Trap on the field. You can only use 1 “Salamangreat Foxy” effect per turn, and only once that turn. From one meta relevant anime archetype to another, we now have Salamangreats to look at starting off with Salamangreat Foxy. Foxy is a Level 3 FIRE Cyberse with 1000 ATK and 1200 DEF. Stats are almost always meh on Level 3 or lowers, FIRE is good right now because of Salamangreat, and Cyberse is just going to keep getting support til VRAINS ends probably. When Foxy is Normal Summoned, you can excavate the top 3 cards of your deck and if you do, you can add a Salamangreat card upon the excavated cards to your hand while the rest are shuffled back into the Deck. Not an immediate search as you are relying on what’s on top of your deck, but a plus is still a plus, and this could work with anything that stacks your deck if Salamangreats have any options to do such a thing but beyond that you barely get to choose what you add to your hand but I’m sure Salamangreats still have a ton of cards they won’t mind in their hand. If this card is in the graveyard and there is a face-up Spell/Trap on the field, you can discard a Salamangreat card to Special Summon this from the graveyard and destroy a face-up Spell/Trap on the field. You’d probably prefer if it’s your opponents otherwise you’re going minus for this unless you banish Balelynx to protect a Salamangreat Spell/Trap and you discard Spinny so he can revive himself from the graveyard. The option here is nice to have, especially for some spot removal against the opponent, but I don’t know how often this will come up. The Normal Summon effect of Foxy alone makes him worth playing, even though you can only use one Foxy effect per turn and only once that turn, any chances to plus is fine and Salamangreats don’t access multiple Normal Summons. Foxy is one you can max on for that potential plus since you don’t lose anything if you don’t excavate a Salamangreat card. Art: 4/5 A computerized fire fox is what I’d hope for with a Cyberse. Salamangreat is definitely another archtype here we’re likely overdue in covering, so it’s fun to do that this week. Foxy is what opens the week (foxy is slang for hot, so I’m onboard already) so, Level 3, Fire (appropriately) Cyberese (loads of support in and out of this particular theme) and 1000 attack/1200 defense. Neither great, but both could be worse on a Level 3 Monster. Lesse, a Normal Summon of Foxy lets you excavate (for the uniformed/forgotten, excavate is to pick up and view, as opposed to adding to your Hand via Draw) the top 3 cards of your Deck and then add an excavated theme specific card to your Hand. The Deck is then shuffled. This is, for all intents and purposes, a +1. One of those awesome +1 that likely is going to net you more than just said +1 before end of turn. If Foxy is in the Graveyard and there’s a face-up Magic/Trap card on the Field (note THE Field, not your Field, or even your opponent’s specifically) by discarding a theme card, you can Special Summon this from the Graveyard, and you’re allowed to destroy a Magic/Trap on the Field. Hence why you only get the first effect upon Normal Summon, as to not make this card overpowered. Only one effect can be used per turn, and only once per turn, which seems a bit excessive, but it’s necessary. Great card here. Nets resources, can cycle itself, can destroy threats…use and abuse this. Art: 4.5/5 Simple, but fun. The swirling colors in the background and cool. I almost get a Wyrm or Insect feel from the part that’s actually shooting the fire. I like this. 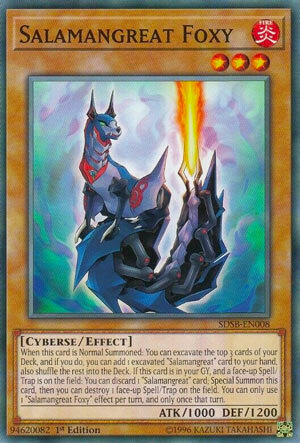 Salamangreat week on Pojo starts up with one of the best cards in the archetype: Salamangreat Foxy. One of the cards you want to see in the opening hand, Foxy is like Dark Magical Circle, as you can get a Salamangreat card off of its three card reveal, but unlike Magical Circle it will cycle the remaining two back into the deck. Not a problem with how much the deck can search. Foxy gets you something hopefully for your trouble off the cuff and starts your combos for the turn. It can pull itself from the grave at the cost of a Salamangreat card, a good 1-for-1 as the deck can dig in the grave as well, then Foxy can give you a plus off a face-up spell/trap pop. Yes you need a face-up spell/trap somewhere on the field, but with Field Spell cards a prominent part of the game and Pendulum Monsters seeing a big resurgence this clause shouldn’t be a problem. While you won’t be using both effects in the same turn, you still get one of these, and that is pretty darn good. A solid 1-for-1 and can make your Link 1 for the deck and start the Link shenanigans. Salamangreat Foxy is great (I didn’t like it either, and I’m only doing it once. Unless there is a tiger one). It is a Level 3 Fire Cyberse monster with 1000 Atk and 1200 Def. The stats are good enough, but the only thing that really matters is that Foxy is a good low level Salamangreat. Upon Normal Summon you can add any 1 Salamangreat card from among the top 3 excavated cards from your deck. The other 2 cards get shuffled back into the deck. I like that you can get another copy of itself even if you can’t use the effect again. The second effect can be activated from the grave if Foxy is in there and there is a Face-Up Spell or Trap card on the field. You get to Special Summon Foxy from the grave and destroy any Face-Up Spell or Trap at the cost of discarding a Salamangreat card. This second effect can really put you at a disadvantage but you do have the option of destroying your opponent’s stuff which helps. Unfortunately, you can only use one effect per turn and only once that turn. It’s still worth it to run multiples of Foxy since it is a great searcher and can potentially destroy any floodgates that are keeping you from executing your plays. That second effect makes Foxy versatile as an engine since it will work with multiple copies of itself for the discard cost. An excellent start to the week. Next articleThe Infinity Chasers – What You Should Know / Yu-Gi-Oh!